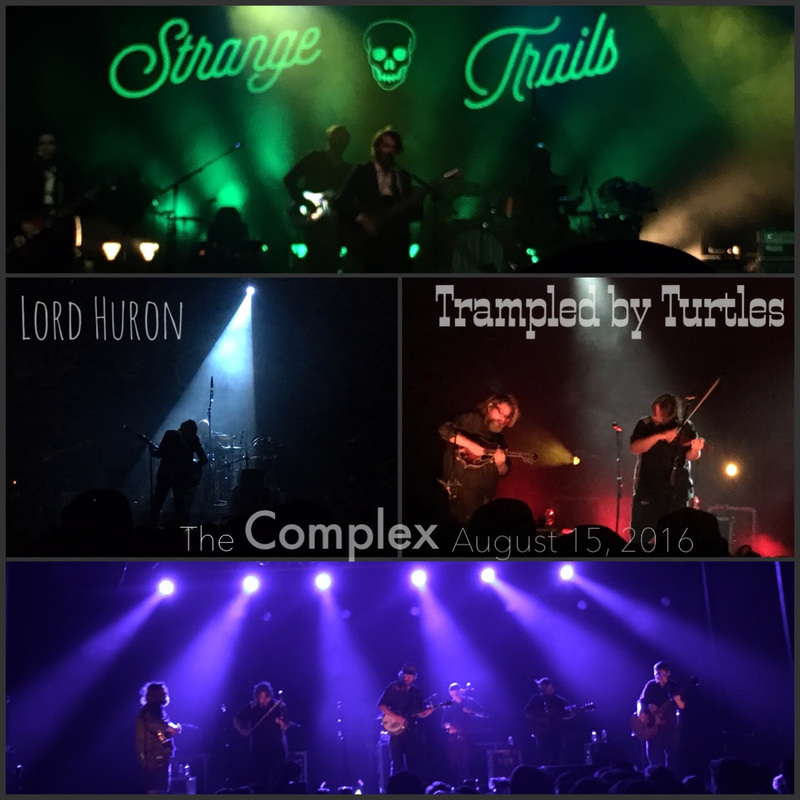 I must admit, before last night, I had no idea that Lord Huron, or Trampled by Turtles even existed. Shame on me because both of these bands are really talented and have great songs. I have totally cheated myself for not having listened to them before. But I’m glad I was given this opportunity to see them. The thing I like most about seeing a band that I am not as familiar with is going into a show with zero expectations. When I go to concerts of bands I’ve followed for years, I have hopes of hearing certain songs, and I expect things to go a certain way. Well with these two bands, I didn’t know their hits versus their deep cuts. Lord Huron took the stage right at 7:30. I think the crowd was surprised by this because I walked right in the Complex and got a great spot dead center. About halfway through the first song, the crowd filled the space around me. I honestly can’t think of a song I didn’t like. The crowd was the indicator from me of which songs were their favorites. My first impression was that these guys belong on the stage at Pioneer Park. These guys would be perfect for the Twilight Concert Series. Next summer maybe? They have a certain indie flair that would be perfect for that setting. Again, not knowing much about the band, I looked to the crowd for information. I could tell that there were some fans there to see one band over another. The thing I like about situations like these is the band and the way they perform their music will determine whether they win over the entire crowd or not. Lord Huron did just that. Before the show was over, they had the entire crowd’s attention. They’re a very straight forward band. Not much talking to the crowd, relaxed stage presence. All that is just fine with me. Some bands interact with the crowd a lot, others not so much. I would prefer bands do what comes naturally than to try to force it. I thought Lord Huron did an exceptional job of pleasing their fans, winning over the others, and for sure making a new fan out of me. I look forward to the next time they come to town. I will for sure be more knowledgeable about their music. After hearing Lord Huron, I think I was most surprised to discover that Trampled by Turtles sounded nothing like them. I guess that’s why there seemed to be a divide in the crowd. Trampled by Turtles would be considered Americana if I were to try to label their sound. They had elements of Country, Bluegrass, and even a little Spanish style in their songs. I found it interesting that the six-piece band (Vocalist/ Acoustic Guitar, Acoustic Bass, Cellist, Banjo, Fiddle, and Mandolin) did not consist of a drummer. And yet the crowd was dancing and moving as if there was one. While I felt like some songs would have sounded great with drums backing the song, I was really impressed with the energy and rhythm they produced drummer-less. Each instrumentalist was a true talent in their craft. Sometimes if felt like there were six soloists, meshing together. And I mean that in a good way. Each instrument had their time to be featured, in particular, the Mandolin and the Fiddle, but when they all played together they created a beautiful sound. I’m sure many of you have heard the term “Dance like nobody’s watching.”. Well, there was something about Trampled by Turtles performance that brought this reaction out of many crowd members. As I looked around the complex, I saw people country dancing, dancing alone, pogoing up and down, and even dramatic slow dance between two dudes, during one of the softer numbers. I think it takes a really talented band, to cause someone to just let loose and move the way you want to, without caring who might be looking on. I really enjoyed this show. If you are foolish like me and haven’t heard of these bands, do yourself a favor and check them out immediately. They are very different in their style, but both incredibly talented.